Southern Arkansas University Foundation honored individuals, companies, and foundations that have contributed to scholarship, academic and athletic programs, and campus projects at the University during the past year at the annual Honors Societies Dinner on October 9, 2008, in the Grand Hall of the Donald W. Reynolds Campus and Community Center. 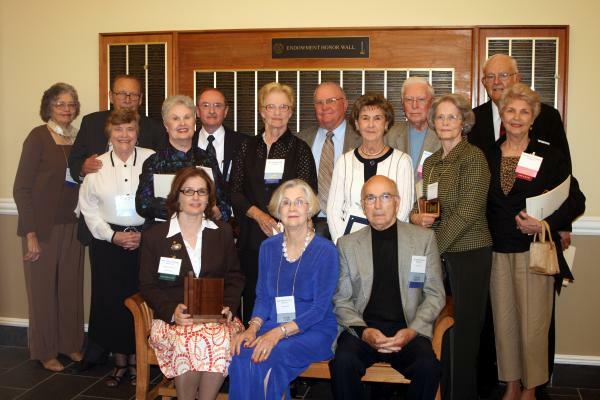 Among those honored were individuals and groups which had completed endowments during the 2007-2008 fiscal year. Endowments provide a continual source of funds for scholarships, academic enrichment, athletic programs, and campus needs. Endowments are often given in honor or in memory of a family member, a favorite teacher, or special person. Each endowment is commemorated with a plaque on the Endowment Honor Wall in the Reynolds Center. Back row (left to right) Mrs. Lu Waters, Arkansas Entergy Retirees Club; Mr. Jim Bailey; Mr. Lowrance Hodge; Mr. Wayne Taylor; Mr. Ray Uhrich, and Dr. Bill Scurlock.